All transactions are safe and secure with a reliable history in online purchasing behind each of our associates. Buy the Napoleon Dynamite Costumes, Moon Boots and Wigs to own Napoleon Dynamite clothing and merchandise. Opt for a complete Napoleon Dynamite outfit or build your own costume with accessories like glasses, wigs and Napoleon moon boots. Choose between the Vote for Pedro costume with matching tee or his more formal outfit that includes a brown jacket with attached vest and light blue tie. 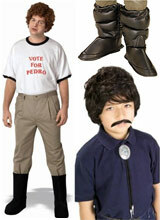 Kip and Pedro costumes and accessories are also available but in limited quantities. In addition to the Napoleon Dynamite Costumes, Moon Boots and Wigs above, browse the Napoleon Dynamite Clothing Gallery for more apparel like men's and women's clothes, kids shirts or hoodies.